No surprise BRMC sold out The Troubadour minutes after tickets went on sale. It’s been a long time since a proper gig was held in LA and we were craving some of that hard-driven, bluesy rock-n-roll that only this band can deliver. 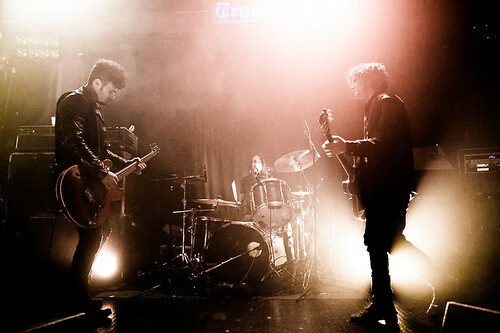 Sure, there were a couple of benefit shows where they played a few songs (tease) and a short trip to the San Diego Race Track, but not since The Echoplex shows back in 2010 have we had our true BRMC fix. Even vocalist/guitarist Robert Levon Been admitted towards the end that they kind of fucked us over. This must mean several more LA shows in the near future! But before the darkness set in, Restavrant came to the stage. Having just toured with Scott H. Biram, Troy Murrah (vocalist/guitar) and Tyler Whiteside (drummer on everything in your garage) were as hot as the hinges of hell. The minute drummer Leah Shapiro, guitarist/vocalist/harmonica Peter Hayes and Been walked out on stage, the beginning of our journey into the BRMC music world began. With a new album due out in March, I couldn’t wait to hear new tunes and was hoping we would hear almost the entire new album. Four new songs were played. The sweet melodic flow of “Lullaby” with Hayes’ guitar skills made me wish I could own the new album now so I can blast that one in the car at night. BRMC more than made up for lost time.